Interesting Month. Started with crashing my bike which kind of screwed up my neck; it's still sore. Then I sprained my ankle. Not one to let these minor set backs bother me too much, I did the Cooper Triathlon; started building some speed work into my runs and also ramped up my run volume! 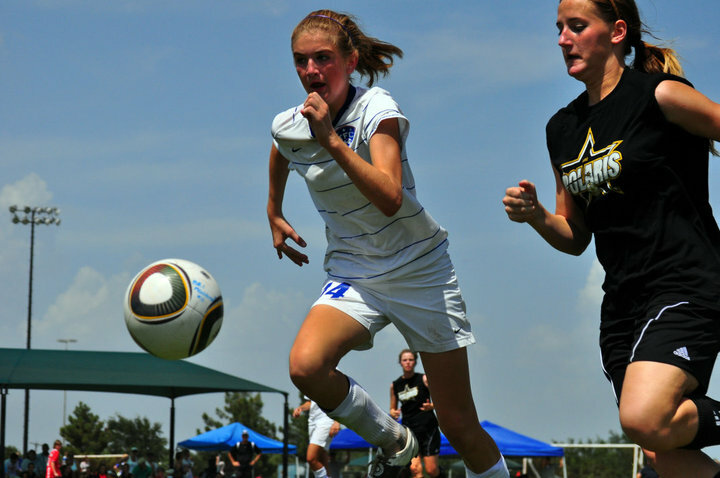 Both daughters had soccer tournaments this weekend. I drew the short straw, however, and was required to take Marissa up to Tulsa for the Sam Shannon College Showcase and Soccer Extravaganza. 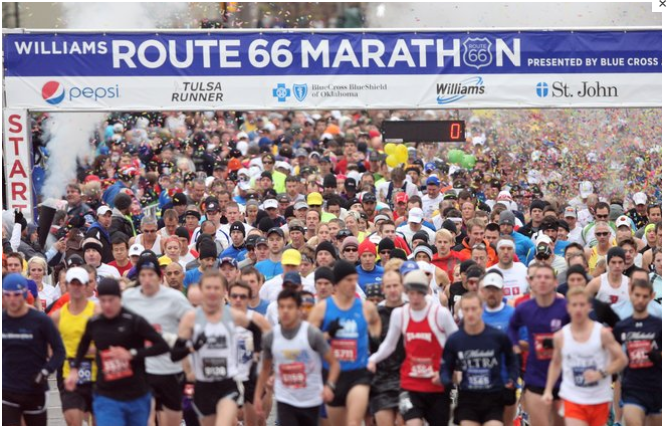 While I was up there I thought I might make up for missing the DRC 5K by running the Route 66 5K on Saturday. In order to make that plan work, it was required that I register for the race by 8pm on Friday. That was cutting it really close, as I had to pick up Rissa from PESH at 4:15. Three hours and change was going to be cutting it really close. Sure enough we hit a bunch of traffic heading out of Allen/McKinney and then I got a speeding ticket in Atoka OK. We got to Tulsa right at 8pm but not in time to get to the convention center and register for the race. So instead, on Saturday I went up there and registered for the Half Marathon on Sunday. 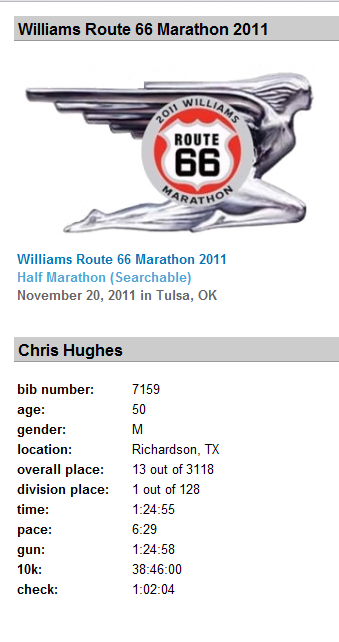 This is to spite the fact that the last time I ran a Half Marathon was exactly 16 years and 16 days ago. Saturday night a cold front blew though Tulsa. The temps were in the low forties and the wind was blowing like a mutha right out of the north. I got up really early and drove up the finish and snagged a parking space that was situated for an easy and quick exit so that I could get back the hotel after the race and check out and then get to Rissa's last game. 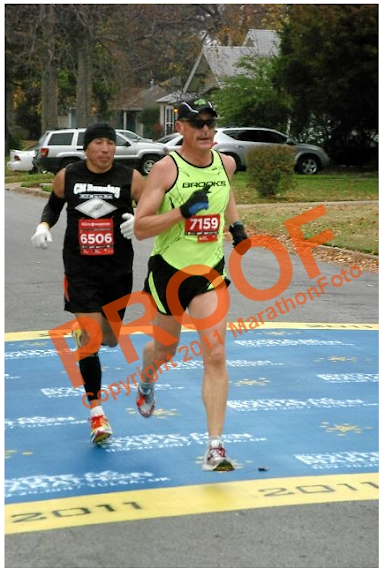 The finish was a bit more than a mile south of the start line. That was good, as that left me a mile warmup to jog up to the race. The race started at 8:00am. At 7:15 I left the car with pants, singlet, tee shirt, gloves, and arm warmers. I had my drop bag with the T7s in them. I warmed up in the Ghosts. The jog to the start was directly into the wind and it was cold as hell. 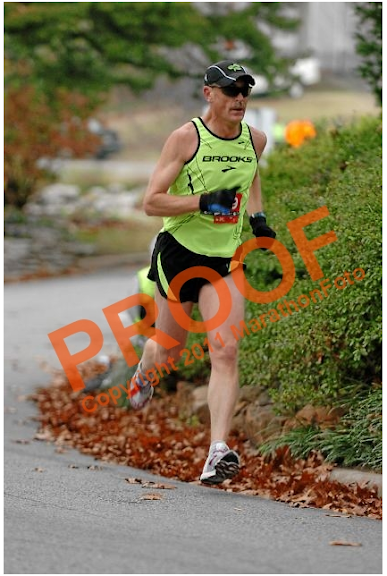 The last three miles of the race was going to be into that wind as well, and I was a bit concerned about that. Once up to the start line area, I did some jogging around and then some strides in the Ghosts and then with like 10 minutes to go, I headed to the bag drop. I was not fully decided about what I should drop and what I should wear but, in the end I decided to race with just the singlet and gloves. I started about three rows back (look for the Lucky Hat and sunglasses). When the gun went off I tried to run smooth and easy. After a half a mile or so I went by some cat whose GPS indicated that we were doing 5:50 mile pace. I hope not! And who the hell would want to listen to that thing spout off pace and stats for a whole race. Good grief. I hit the first mile in 6:10 which was faster than I wanted to be going, but I tried to keep my pace manageable. Second mile in 12:22. Third in 18 something. I was running pretty consistent. Five miles was 31 something. And 8 miles was 50 flat! After the second mile the field had spread out and it was just me and this one guy taking turns. He would pull ahead of me on the up hills and I would pull ahead of him on the down hills. After the third mile he decided he was going to draft off of me. I had a quick glance at him and decided he could be a masters runner and that I should be careful with this guy. 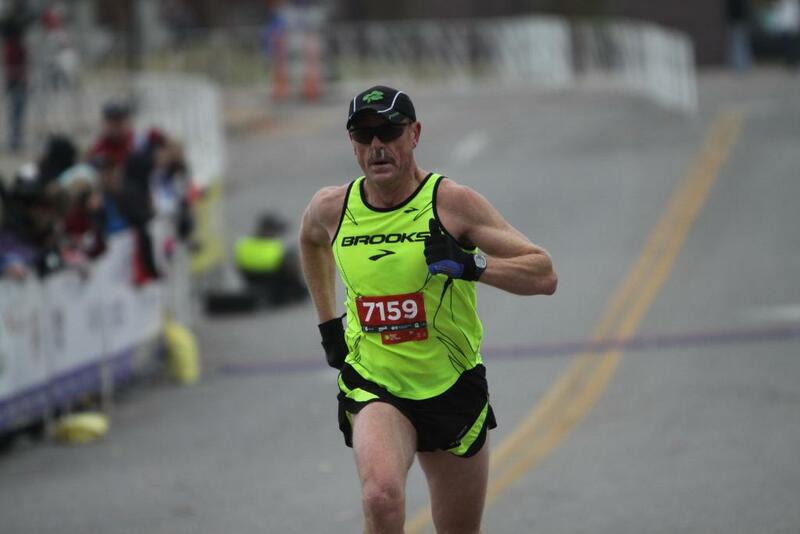 There were not a whole lot of runners ahead of us either, so it was possible that we were racing for the masters title. I threw in some surges, but he responded to everything I threw at him. As I mentioned the last three miles were right up Riverside straight into the wind. At mile eleven this guy threw in surge and went right by me. I was unable to hang with him. 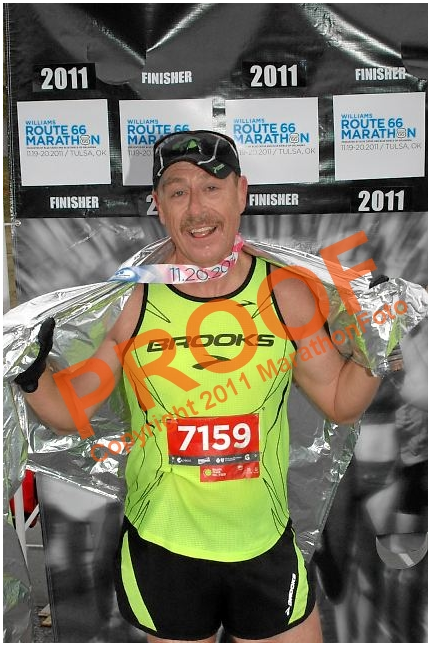 Shortly after that I was passed by a young marathoner and tired to go with him, which was also not happening. At 12 I was feeling better and tried to push as hard as I could. I might have gained a bit on this guy. When I got to the finish the clock was rolling at 84:55, 56, I found a new gear to keep it under 85. Amazing. 13th overall, 3rd Master, and first in my age group. The guy I was running with was 12 years younger. Given that i had no idea what to expect or what I could manage for this race, I have to say I was pretty happy with the result! Pretty much of a best case scenario for sure. And If I was a bit slower say 6:15 or even 6:20 on the first four miles, I imagine I could have held 6:30s for the last three miles. In last weeks update of the SMW Rankings, I finally got on the board, 6th in my age group and more surprisingly in the top 100! Running has improved this week. Legs were dead to start intervals on Monday, but came around toward the end. Nice swims on Tuesday and Friday. Friday I outlasted Ron, Harold, Moody and Dino!! Saturday, we had a nice ride down to WRL with Terry and Jane Z. And Sunday a good effort at the usual 12 mile loop. Saturday Nov 12: WRL Loop with TZ and JZ! (Ave 16.1, CAD 79, Ride Time 3:21, Alt 745, Temp 59) 53.9 Miles Bike. Sunday Nov 13: 93 min (Recovery 54) 12 mile run.